USA Today has a new article up focusing on Harrison Ford, star of the upcoming Indiana Jones and the Kingdom of the Crystal Skull. One thing that stands out from the article is Ford’s comment that he is considering doing a fifth installment in the franchise. There’s also some news on the possible length of the film. Click through the jump for the details. 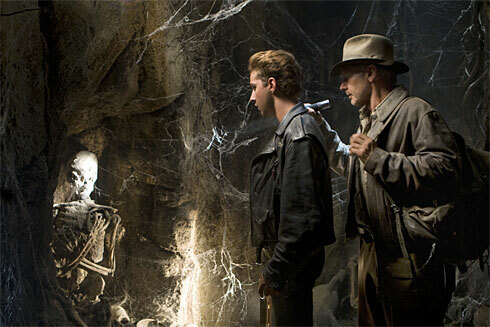 Many of the plotlines of Crystal Skull are still secret, but Ford says the movie will try to give new perspectives on his globe-trotting, fist-fighting archaeologist. Jones happens to be among Ford’s favorite characters, and he has put his own curmudgeonly rogue qualities into him. “He’s a guy who is pretty clear from the beginning,” Ford says. “He has not changed so much between films. But we’ve learned more about him, through various plot devices, such as the introduction of his father. And we’ll learn something more about him in this film. I think it’s required. If you’re going to bring back a character, you’ll have to supply the audience with something more and different. He also might consider a fifth installment of Indiana Jones, though he hopes it wouldn’t take 20 years to pull together. In other news, Hollywood Elsewhere is reporting that the length of the film will be two hours and twenty-plus minutes.